One nozzle features a solid swirling water jet that gives thorough cleaning of the posterior. The other nozzle provides softer, gentler cleaning that is more suited for feminine hygiene. Nozzle moves back and forth automatically, improving cleaning efficiency and blood circulation in capillaries, which helps prevent haemorrhoids and constipation. Personalise your comfort with adjustable settings for water temperature, air temperature and water pressure. Gently dry off with warm air. The hydraulic lid and seat close quietly and gently - no more slamming noises! With adjustable seat warmth, your Royalet will always have a warm welcome for you. Also, nozzles are accurately positioned to ensure used water drains directly, without splashing back on your body or the nozzle. Nozzles perform a rinse function before and after each use. The seat and nozzle are formulated from Anti-Microbial plastics, to help prevent bacteria from contaminating the surface. One push button activates the air deodoriser to help remove any offensive odours. The energy saving function sets the various temperatures at the lowest sustainable levels to minimize power usage. 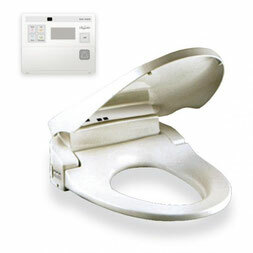 Bidet will only operate once the infrared sensor is activated.